For generations of sporting men baseball and boxing were the two most popular sports in the world. It was not until the post WW 2 era that other sports started to gain in popularity. Not until the 1960’s did boxing begin to take a backseat to sports such as football and later basketball. In the Oct. 9, 2006 issue of Sports Illustrated a panel of 22 experts submitted their list for the All Time All Star baseball team. The SI listing is a who’s who of the greatest names in the history of baseball. In like manner, the IBRO (International Boxing Research Organization) published a listing of the greatest boxers of all time in IBRO Journal # 91 Sept, 27 2006. The IBRO is an esteemed group of analysts who are well researched in the history of boxing. The IBRO membership had 30 historians participating in the poll. Votes were on a points based system. Voters submitted a list of 20 boxers with one point for a 20th place vote and 20 points for a first place vote. This lineup of boxing greats is as definitive as it gets. The point of the poll was to achieve a community sentiment as to who were the greatest fighters of all time. Having 9 of the top 10, 14 of the top 15, and 21 of the top 25 finishers when comparing to my own personal ratings one can see that the ratings were fairly uniform with the consensus of experts concurring to a large degree. Here is a roll call of the 25 greatest fighters of all time. Sugar Ray is considered by the majority of boxing historians as the greatest fighter of all time. He started his career at lightweight but could knock out middleweights with one punch from either hand. Robinson was completely dominant at welterweight. His peak record was 128-1-2. He had a 91 bout winning streak against first class competition. As a fighter he could do it all, he had speed, power, fluid boxing skills, and could take a tremendous punch. He was never physically knocked out in over 200 fights. Not only was the Sugarman the complete package but he was as close to perfection as it gets in boxing. Ray received 60% of the first place votes. 27 of 30 placed him inside the top three. Robinson is the only fighter who did not receive a vote outside of the top 10. More than a third of the voters had Greb in the top 3. Nearly two thirds of the voters had Greb in the top 5. 28 of 30 voters placed Greb inside the top 10. How anyone could possibly rate him lower is beyond comprehension. Greb defeated 5 world middleweight champions, 7 world light-heavyweight champions, and one world heavyweight champion. Although never much more than a middleweight he won literally dozens of fights against heavyweights including top contenders like Bill Brennan and Billy Miske who fought for the heavyweight title. Greb’s fast swarming, pressure style was difficult for opponents to handle and he could break down anyone’s fundamentals with his nonstop punching. He threw so many punches he was a whirlwind in motion and would get inside an opponents comfort zone and smother them with fusillades of punches from all angles. Greb also had one of the great chins of boxing history. In around 300 fights he was really stopped only once- in his first year as a pro. He failed to last the distance only one other time when he broke his arm in a fight against Kid Graves. Having absorbed the punches of heavyweights without falter there is no way any middleweight who ever lived would knock out a prime Greb. No way. Greb is easily one of the top 2-3 fighters of all time. Henry Armstrong held 3 of the 8 major divisional titles that existed at that time simultaneously. “Hammerin’ Hank was featherweight, lightweight and welterweight champion, no junior titles. Had a dubious draw against Ceferino Garcia for the middleweight title gone his way he would have held half of the titles in existence in that era. Armstrong had an amazing run of victories. From 1937 to late 1940, he lost only one fight. His record against topflight competition during this time was 59-1-1 with 51 knockouts. He scored 27 straight knockouts during 1937-1938. Nearly a third had of voters had Hank inside the top 3. 25 of 30 voters had him in the top 10. There is no doubt that Muhammad Ali is one of the greatest fighters of all time based on his record. He met and defeated the best competition in heavyweight history. As a boxer Ali was exceedingly fast beating his opponents with a blinding jab, swift flurries and fleet footwork. Although not a devastating puncher he was a marvelous boxer with great natural ability. Ali possessed a chin and heart for the ages. His speed, reflexes and timing of distance made him a very difficult opponent to engage successfully. Ali beat Sonny Liston, Floyd Patterson, Joe Frazier 2 of 3, Ken Norton 2 of 3, George Foreman as well as hard hitting contenders like Ron Lyle and Earnie Shavers. More than two thirds of voters had him in the top 10. 26 of 30 voters nominated him among the 20 greatest boxers of all time. Louis was the most fundamentally flawless heavyweight in history. He fought out of a tight structure with his chin down, hands up and his right hand in perfect punching or parrying position. Louis threw short, compact explosive punches and is regarded as perhaps the most effective puncher of all time regardless of weight. Not only did Louis carry lethal power in either hand but his punching accuracy was phenomenal. Louis threw every punch perfectly. The “Brown Bomber” threw some of the most sudden and devastating combinations ever seen. Louis holds records for most title defenses and the longest title reign in his weight class. More than two thirds of voters had him in the top 10. 26 of 30 voters had him in the top 20. The Boston Tar Baby was an exceedingly strong, stout fighter of overwhelming ability and punching power. He had a great chin and heart. Although a natural middleweight he was at his peak as a light-heavyweight. Sam scored knockouts over nearly all of the top heavyweights of his time. Langford is either first or second for scoring the most knockouts in boxing history depending on whose research one accepts. Sam defeated 6 Hall of Famer’s; Joe Gans, Dixie Kid, Sam McVey, Joe Jeannette, Harry Wills and Philadelphia Jack O’Brien. Langford received the second most first place votes, but was a distant second to Robinson. More than half the voters had Sam in the top 10. 25 of 30 voters had him inside the top 20. Duran was easily among the greatest lightweights and greatest fighters of all time. He achieved a peak record of 72-1 that included winning the lightweight and welterweight crowns. He successfully defended the lightweight title 12 times, 11 by kayo. Duran was a strong, swarming type fighter who was so much more than just a swarmer. He had outstanding defense, slipping punches and countering with the best of them. He was really only knocked out one time in over 100 fights against Thomas Hearns at Jr. Middleweight. Duran became the only lightweight champion to win the middleweight title when he defeated the much bigger and stronger Iran Barkley. More than half the voters had Duran in the top 10. 28 of 30 had him in the top 20. Benny was an exquisite master boxer. He could jab, move, block, counter and throw combinations with the best of them. He was the ultimate thinking man’s fighter who demonstrated that brains overcome brawn. He was virtually unbeatable at lightweight. Benny defeated the best competition to ever appear at one time at 135 pounds. Leonard beat Hall of Famer’s Johnny Kilbane, Johnny Dundee, Willie Richie, Jack Britton and Lew Tendler as well as excellent lightweights such as Freddie Welsh, Rocky Kansas, Richie Mitchell, Patsy Cline, and left hook artist Charley White. More than half the voters had Benny inside the top 10. 26 of 30 had him in the top 20. Pep was a “will-o-the-wisp” master boxer who relied on speed, accuracy and movement to confound opponents. He could box, slip, dodge, block and evade punches like almost no one else. While not a great puncher he was nonetheless a highly gifted boxer. When opponents signed to fight Willie Pep they must have known they were going to lose. Pep achieved the greatest peak won-loss record in history 134-1-1. One third of the voters had Pep in the top 10. 25 of 30 voters had Pep in the top 20. Bob Fitzsimmons is one of those rare fighters who was simply a freak of nature. He had small spindly legs, but tremendous back and shoulder muscles that supplied the power for his devastating straight punches. Fitz had a great left hook and was a debilitating body puncher. “Ruby Robert” was the first true Triple Crown champion winning titles at middleweight, light-heavyweight and heavyweight. Although never much more than a middleweight he knocked out heavyweights contenders such as Tom Sharkey, Peter Maher and champion James J. Corbett. 20% of voters had Fitz inside the top 5. About half had him in the top 10. About two thirds had him in the top 20. Prior to WW2 the names Joe Gans, Benny Leonard, and Sam Langford were most often given to the question as to who was the greatest fighter of all time. Gans was a great lightweight who was so good he was considered too good to be true. The “Old Master” was a great athlete with the speed, agility and uncanny reflexes of a Muhammad Ali or Roy Jones, but with pound for pound punching power like Joe Louis, albeit at lightweight. Gans was a ring marvel of speed and athleticism with tremendous reflexes. His reaction times were so quick that his opponents thought he could read their minds because he was able to anticipate and counter them so quickly. Gans made 14 successful defenses of his lightweight crown before age and declining skills due to Tuberculosis caused him to deteriorate rapidly. The disease took his life 2 years after he finally lost the title. Nearly 25% of voters had Gans in the top 6. More than a third had him in the top 10. More than two thirds had him in the top 20. The “Cincinnati Cobra” was a master boxer of extraordinary skill and ability. He had speed, agility, fast hands and excellent footwork. Charles possessed a masterful jab and was a superb combination puncher. He was at his peak as a light-heavyweight. His record is quite impressive. Against top rate opposition like Archie Moore, Charley Burley, Lloyd Marshall, Jimmy Bivins, and Joey Maxim he was an impressive 16-2 combined. Despite being a natural light-heavy he won the heavyweight title and made 9 successful title defenses. Nearly 25% of voters had Charles in the top 10. Half of the voters had him in the top 15. Two thirds of voters had him inside the top 20. Ray Leonard was one of the most successful boxers of all time. Winning a gold medal in the 1976 Olympics he went on to become a financially secure professional champion. Winning titles at welterweight, junior middleweight and middleweight as well as a winning a version of the light-heavyweight crown Leonard demonstrated his greatness as a boxer. Leonard possessed speed of hand and foot, tremendous vision and coordination, a great jab, a powerful left hook and a blistering combinational array of punches. Leonard beat 4 Hall of Fame quality fighters; Wilfred Benitez, Roberto Duran, Thomas Hearns and Marvin Hagler. Although Ray did not have as many fights as the greats of the past not many can claim to have beaten better competition in their prime years. Ray demonstrated the intangibles such as will and heart in his fight against Tommy Hearns, toughness and durability in his first bout with Roberto Duran, and he demonstrated ring intelligence in his bout against Marvin Hagler. 20% of voters had Ray Leonard in the top 10. More than half the voters had him in the top 15. 23 of 30 had him in the top 20. Wilde, like Fitzsimmons, is one of those rare fighters who can be classified as a freak of nature. A small, waif of a man he was an underweight Flyweight champion who weighed about the same as Ricardo Lopez, but with the power to starch bantamweights. He was a tremendous body puncher and slippery swarmer. Wilde went undefeated in his first 98 bouts, lost only 4 times in 150 pro bouts and scored 100 knockouts. Nearly a third of voters had Wilde in the top 10. Two thirds of voters had him in the top 20. Jofre was called a “bantamweight Sugar Ray” by Nat Fleischer. He was considered by experts of his era to be the best pound for pound fighter of the early 60’s. Jofre was a flawless boxer with consummate boxing skills and knockout power in both fists. Went unbeaten in his first 50 pro fights and won his last 25 in a row before he retired as champion. His total record was 72-2-4 (50 knockouts). Jofre was 2 time bantamweight and also world featherweight champion. 16% of voters had Jofre in the top 10. More than half had him in the top 20. Walker was an epitome of a “pound for pound” fighter. Mickey was a muscular and physically strong swarming style slugger. Walker started off as a great welterweight champion then moved up to become middleweight champion. Despite his small size the “Toy Bulldog” competed with success against heavyweights beating heavyweight contenders Kingfish Levinsky and Paulino Uzcudun and drawing with heavyweight champion Jack Sharkey before succumbing to Max Schmeling who was simply too hard a puncher for the game and tough Walker to overcome. Two thirds of voters had Walker in the top 20. 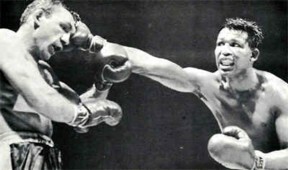 The “Old Mongoose” Archie Moore holds the “official” record for the most knockouts in boxing history. Moore was a crafty, veteran who used his experience, guile and deceptive cleverness to lure opponents into his lethal strikes by using a cross armed defense combined with a calculating offense. He fought for 27 years most of them as a top contender. Moore reigned as light-heavyweight champion for nearly 10 years. Didn’t receive a title shot until he was 39 but held title it until he was 48. Nearly 25% of voters had Moore in the top 10. More than half had him in the top 20. In the 1950 AP poll Dempsey was voted as the greatest fighter in ring history. Today his legend has diminished perhaps undeservedly so. One thing is for sure Dempsey was a savage killer in the ring. He did not know remorse; he had no pity on his rivals. Dempsey would attack like a caged animal hungry for blood. He had quick hands, explosive power and a strong chin to go along with his swarming attack. Dempsey holds the record amongst first tier heavyweights for most first round knockouts at 25. His peak record was 32-0, 28 knockouts with 17 of them coming in the first round. 20% of voters had Dempsey in the top 10. More than a third had him in the top 20. Certainly Ring magazine founder Nat Fleischer would have approved of Johnson being rated among the greatest fighters of all time as Nat considered “Lil Arthur” to be the best fighter he ever saw. Johnson had great natural ability in a class with fighters like Muhammad Ali. Johnson was a physically strong fighter but one who used his great strength for defense. He was exceptionally fast and athletic and dominated his foes in a safety first manner much as Roy Jones did, although Johnson fought much better competition. Jack defeated Sam McVey, Joe Jeanette, Sam Langford, Tommy Burns, Stanley Ketchel and Jim Jeffries. Johnson had a 10 year unbeaten streak. More than a third of voters had Johnson in the top 20. Rodney Dangerfield made famous the saying, “I never get any respect.” Perhaps Gene Tunney could also make that claim. His record certainly deserves respect. With a record of 83-1-3 his winning percentage is an impressive 95.40. Not too many greats on this list can come close to such a record. Tunney’s record against Hall of Fame fighters is 9-1-1. Tunney beat HOF fighters, Dempsey two times, Greb three times, Battling Levinsky, Tommy Loughran, Tommy Gibbons, and Georges Carpentier. Although best known as a heavyweight he was at his peak at light-heavyweight. More than a third and close to half of the voters had Tunney in the top 20. Ketchel was one of the greatest punchers in ring history. He possessed granite fists, superb stamina and a great chin. 40 of his 41 wins before he won the title were by knockout. His total record 52-4-4 with 49 knockouts demonstrates his crushing power. 19 of those knockouts came in 3 rounds or less. Two of his losses were in his first year as a pro and one to heavyweight champion Jack Johnson. His only significant loss was to Billy Papke, a loss he avenged with a horrible beating that he inflicted upon his opponent. Ketchel died as champion at the age of 24. One third of voters had Ketchel in the top 20. Walcott is the 3rd fighter on this list who can classify as a “freak of nature.” Walcott was called a “sawed off Hercules” by Nat Fleischer. Indeed his short, stocky build combined with his awesome punching power and thick bone structure made him a very hard man. Walcott was barely a welterweight yet he knocked out light-heavyweights and even heavyweights. The “Barbados Demon” weighed in at 137 when he knocked out 173 pound hitter Joe Choynski in 7 rounds. This was the year before Choynski knocked out Jack Johnson. Walcott also beat light-heavyweight champion George Gardner. One of the most avoided fighters in boxing history Walcott finally got his shot at the welterweight title against Rube Fern whom he dispatched in 5 rounds. A gun accident to his hand nearly ended his career but he was a marvel of the ring in his prime years. Nearly a third of voters had Walcott in the top 20. Rocky is the only unbeaten and untied champion in boxing history. 49-0 is his legacy. His knockout percentage of 87.75 is the highest among all heavyweight champions. Marciano was no boxing master but he was a strong and determined swarming slugger whose non stop aggression eventually wore down his opponents. A greatly conditioned fighter Marciano is certainly worthy of consideration on a “pound for pound” list. One third of voters had him in the top 20. Canzoneri was a 5’5” pressure fighter who also possessed great boxing skills. He was a two-time champion by age 22. By 23, he was considered the best fighter in the world. Tony was a Triple Crown champion who fought in a talent rich era and defeated Hall of Famer’s Benny Bass, Kid Chocolate, Lou Ambers, Johnny Dundee and Billy Petrolle. He was stopped only once, in his last fight of a 175 bout career. Nearly a third of voters had Canzoneri in the top 20. Ross was the 3rd fighter in boxing history to become a Triple Crown champion. Ross was a sharp counter puncher with solid defense and one of the best chins in boxing history. He was never knocked out in an 81 bout ring career. Never more than a blown up lightweight Ross won titles at lightweight, Jr. welter and welterweight. Beat Canzoneri two times on close decisions and Jimmy McLarnin 2 of 3. Ross was awarded a Silver Star for bravery for his actions at Guadalcanal during World War 2. One third of voters had Ross in the top 20. There you have it, a listing of the 25 greatest fighters of all time as given by the IBRO. My personal top 25 varied a little leaving off a couple of the heavyweights in the lower portion of the list and included Alexis Arguello, Thomas Hearns and Julio Cesar Chavez. I am sure the list will be debated. Opinions will vary somewhat but the point of a list like this is that a poll of qualified experts is better than the opinion of any one person because it reflects a consensus of opinion. Ray Robinson is considered to be the greatest fighter of all time because a majority of historians opinioned that he is. This is a very good list. Every fighter named was a true all time great in boxing ability and/or punching power as well as record and accomplishments. Note: In places where boxers tied for the same amount of points they are listed alphabetically. Ali and Louis tied for 4-5th in points as did Charles and Ray Leonard at 12th-13th. Ross edged Ike Williams for the final spot although they finished with the same amount of points.